take a visit in Calape (Brgy. Bentig – Calunasan) Chapel of Virgen sa Kanunayang Panabang – Virgin of Daily Refuge. An image of a Virgin grows inside a sea shell until the present day. We finally went to Bohol for a week. We saw everything you posted in your blog except we missed the Puntacruz Watch Tower, and the Danao Adventure Park, the other old churches and the 2nd oldest Bell Tower , Mag-aso Falls, and the Hinagdanan Cave, Stone Bridges,… but we had fun going to Bohol via RORO from Manila-Laguna-Quezon-Bicol-Samar-Leyte-Bohol. For 3 days straight, 2 stop overs at Naga and Tacloban to sleep and recharged…. thanks for your wonderful blog…. and for promoting the Philippines and inspiring us to travel more. When my family went to Bohol we missed the zipline activity which they said was after the chocolate hills. Where is it exactly located? Also saw the Tarsiers. Im just wondering if their constant exposure to people does not hamper their condition. I also thought that they live in a more forested area. Zipline is in the town of Danao, 30 minute drive from Chocolate Hills complez in Carmen Victoria. 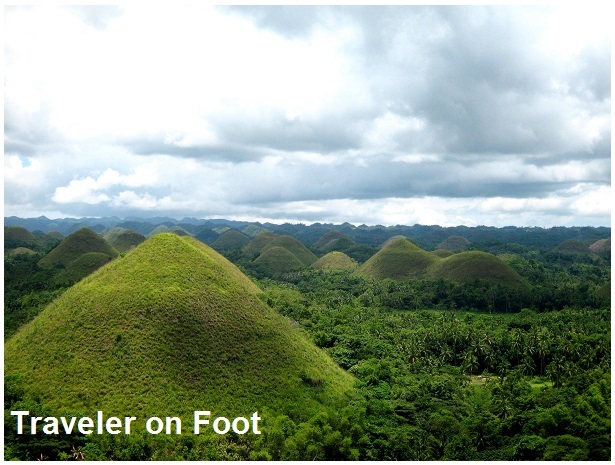 The Chocolate Hills are ancient coral ridges laid down by wind on a shallow sea. The sea receded and the ridges were eroded to form the hills. I’ve been wondering if Chocolate Hills were man-made and if it is how and why it was built.I haven’t seen nor read anything about the evolution of this hills. They are natural rock formations Jaime.